This is why I love reading. This book is amazing, even though it made me cry. I am glad I read it. John Green, is really talented. Why haven’t I read more of his work?. Well I sure, am going to. I laughed, I cried and I fell in love. This one is going to my favorite shelf. It’s really well-written. Each and every line is beautiful and deserves to be quoted. Hazel Grace, she is the incredibly like-able. She is witty, sarcastic, brave and so real. My heart goes out to her. She has such a tough life and yet she manages to be strong. That’s really impressive! She was never whiny or melodramatic. John Green has done a great job writing from a female perspective. Augustus, he is a great guy. I wish he had a different fate. I wish so many things for him. But like he says, “The world is not a wish granting factory”. He and Hazel were adorable together. There story was so sweet and romantic. I am so glad they found each other. The book is so honest, it touched my heart. It’s something you will treasure on your bookshelf. I like how it ended. I like how it began and I loved everything in between. 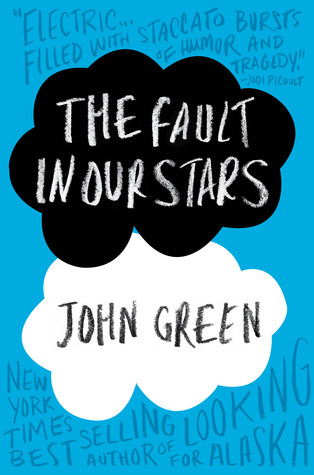 Which is your favorite John Green’s book? Cover Reveal & Review: I Loved You First + Giveaway! On the other hand, I didn't like Augustus that much, and didn't really shed any tears. But it was still a great book. I haven't read any John Green books yet but it looks like I'll have to change that! This book sounds so inspiring, and I'll definitely put it on my TBR list! Good review! Great review! I loved this book as well, definitely in my top five for this year.